Lunarfurniture.com – wooden furniture is a frequently chosen by people as the house’s interior ornament. People love to have this wooden furniture since this kind of furniture is famous on its classic and beautiful style and also the long durability if we compare it with other furniture types. Well, wooden furniture is not only about beauty, this kind of furniture is also very comfortable to be used inside the house or building. These are the reasons why the wooden furniture is very famous in this country. If you have wooden furniture in your house, you must understand that this furniture needs to be cleaned carefully. If we do some mistakes in cleaning the wooden furniture, we can make it damaged, dulled, or obsolete. 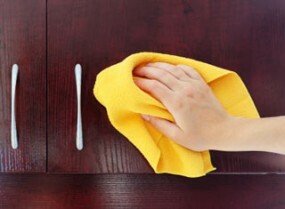 Here are some tips that we can do in order to clean the wooden furniture perfectly. · The main problem in cleaning the wooden furniture is the dust and dirt. We must clean the furniture frequently in order to take out the dust and the dirt. We can use some tools, such mini vacuum cleaner which is equipped with a kind of brush on the edge, dry cloth, and maybe some wooden furniture cleaner oil which can be poured a bit to the cloth. Well, we can even use the duster to clean this dust and dirt easily. · We must prevent the wooden furniture from being spoiled by water, or some liquid such as alcohol, foods or even cosmetics. The reason of this prevention is because of the wooden characteristic which absorbs the liquid spots from those items which might be difficult to be cleaned. · If your furniture is not varnished, you can use the wet cloth which was drowned in the soft formula soap contained warm water to clean the wooden part, you can also use the dry cloth to dry the furniture up. · If your furniture is varnished, you need to use a kind of a special wax annually to keep the furniture remains shining. This wax can protect the furniture from humidity or dust.